If you’re looking for a break in the Big Apple, take a relaxing time-out at some of the best parks in New York City. In fact, there’s no time like the present to slow your hectic pace with a quiet hike along a tranquil park pathway. With so many remarkable parks scattered throughout Brooklyn and Queens, you can be on the path to inner city bliss in a New York minute! In the hamlet of Queens, Astoria Park awaits you for year-round frolics in the city. The summer months call you to cool-down in the Astoria Park pool, a city landmark that hosted the 1936 and 1964 Olympic trials. You can also get moving with a competitive game of tennis or basketball or perhaps a spry trek on the track or walking trails. Adventure continues at some of the park's bright and inviting playground areas as well as music at the bandstand. The park also brings everyone together for fitness fun with its community-based Open Run, a free weekly run-and-walk initiative. Situated along the scenic East River, Astoria Park offers strikingly different views of the Triborough and Hell Gate Bridges with every changing season. Experience the biggest and best that New York City’s public parks have to offer at Flushing Meadows Corona Park in Queens. The site of the 1939 and 1964 World's Fairs, the exciting atmosphere of this park will delight you in many ways. Get lost in a playful game of soccer, baseball, tennis, or even cricket. Catch your breath at the park zoo or let the botanical gardens take your breath away. Other inspiration calls you to the park’s art and science museums. Lose yourself in one of the park's six playgrounds, fly your kite or model airplane at the grassy airfield, or launch your boat or kayak at the water’s edge. A unique adventure awaits you in the city anytime at Flushing Meadows Corona Park. Hidden treasure awaits discovery in New York City at Fort Totten Park where the East River meets Long Island Sound. Explore the nearby landmarks and shoreline of Queens by foot, bike, or canoe. Take a dip in the Fort Totten Park Pool on a glorious summer day or bask in the sun at the grassy poolside. Team up with an urban park ranger at the visitor’s center for an exciting guided tour of the park’s Civil War fortress and its enduring wildlife scene. Some other regular park events include Family Camping & Astronomy as well as the park's Fitness Walk. The Fort Totten Park also features a nature center, playgrounds, and soccer fields for those who find their way to this gem. Get lost in the city at Brooklyn Bridge Park, a vibrant waterfront park in the heart of Brooklyn. Live in the moment as you explore this timeless park’s gentle hills, playgrounds, ball fields, and pier and beach areas. Whether by sunlight or sunset, majestic views of the city’s gleaming skyline are sure to delight you, especially in the Squibb Bridge and Park area. Equally pleasing is a round-and-round-again spin on Jane’s Carousel, an exquisitely restored and popular park ride. Enjoy the park's unique habitat at the visitor's center which features interactive learning activities, a river aquarium, and the park’s ecology and design history. In warm summer weather, the Brooklyn Pop-Up Pool offers park-goers a refreshingly cool time. The park’s numerous indoor fitness centers will also help you stay in tip-top shape year-round. Whatever your interests, you’re certain to have a wonderful time every season at Brooklyn Bridge Park. Your prospects for an unforgettable time are guaranteed when you visit Brooklyn’s Prospect Park. Brightly-painted horses and fantastic creatures await to take you for a spin on the park’s famous Carousel ride. If you enjoy seeing real animals, then you're in luck because ore exotic animals live in their natural habitat at the Prospect Park Zoo. Your water adventure awaits at the LeFrak Center where boating, water activities, and seasonal ice skating meet up with a roller skate rink. Head for the Prospect Park Audubon Center at the historic boathouse, which features hands-on nature exhibits for all ages. The Pop-Up Audubon program also sponsors additional interactive activities throughout the park. Ready for more fun? Visit the 18th century Lefferts Historic House showcasing a functioning garden, period artifacts, and furnishings as well as hands-on activities like candle-making and sewing. For organized sports fans of all ages, Prospect Park provides a 40-acre recreational area for baseball, football, and soccer as well as basketball, tennis, and volleyball courts. Looking for that unique, one-of-a-kind place to visit in New York City? Strike out anytime for a day of home run hits in Brooklyn at the Coney Island Beach and Boardwalk, an amusement park of sorts but a park nonetheless! A short stop at Luna Park will get you in the lineup to ride the Cyclone, the “Big Momma” roller coaster of Coney Island. You can also take a spin on the Sling Shot or cross the finish line on the Steeplechase ride. Test your throwing skills at the Ring Toss, Pong Pool, or Pyramid Smash carnival-style game booths nearby. And don’t forget the bumper cars, arcade, go-karts, aquarium, circus sideshow, and museum! Before you leave, pick up a few mementos at one of the many souvenir shops so you can remember your day at the Coney Island Beach and Boardwalk. You can pre-plan your trip with an interactive map at the Coney Island Fun Guide. 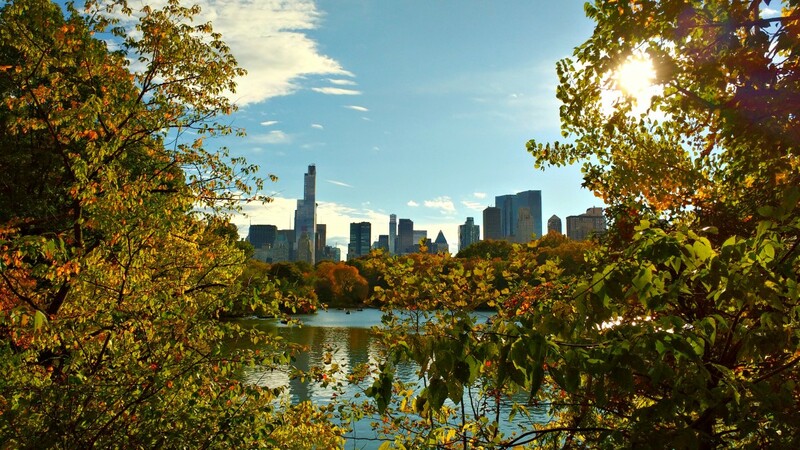 With so many exciting things to do in The Big Apple, you are sure to find your perfect morning, afternoon, or weekend adventure at the best parks in New York City. For more things to do in New York City, register on 718area for your guide to everything to the Big Apple.